The old Long Beach Courthouse was functionally and physically deficient, ranking among the worst in the State in terms of security and overcrowding. The building was outdated, overcrowded, not able to meet the State's current needs—and therefore incapable of meeting the region's growing demand for court services. View from corner of Broadway and Magnolia from the Courthouse Parking Garage. The Governor George Deukmejian Courthouse is located at 275 Magnolia Avenue, Long Beach, a six-acre site one block northwest of the previous courthouse. The project site was acquired under a property exchange agreement with the City of Long Beach Redevelopment Agency. The five-story building houses 31 courtrooms, as well as court administration offices, Los Angeles County judicial agency lease space, and retail leasable space. The building includes below-grade detention facilities and separate secure parking for judges. A five-level, open atrium, enclosed on the two exterior perimeters by a cable-supported glass curtain wall system, serves as the single entry point for all building occupants and provides access to a secured exterior courtyard. Clad in a deeply articulated curtain wall and elements of stone, the project spans two city blocks in downtown Long Beach. In addition to constructing the new building, the project team also renovated and expanded an existing 399,000-square-foot parking structure (approximately 1,000 parking spaces) built in 1974, which is presently operated and maintained by the Project Company through the term of the concession. The courthouse was designed to achieve LEED™ Silver certification by the U.S. Green Building Council but was ultimately certified as LEED Gold with no additional cost to the state. Five Story Atrium. View to bridges and hallways in public areas. View to public escalators and wayfinding. A main goal of this project was to use a delivery and operations method that would allow the Judicial Branch to deliver the building without creating debt while committing to regular maintenance, repair and replacement. Considering that, the facility is the first social performance-based infrastructure (PBI) project in the United States. Under a turnkey public-private partnership (PPP/3P), the cost and risk of the courthouse, including development, design, construction, operations, and maintenance, were transferred from the public sector to a private-sector team. In the meantime, the design process for all new courthouses recently completed or now in design and construction in California regardless of their delivery method need to comply with sustainability requirements, Judicial Council design standards and applicable codes and ordinances. These codes and standards promote buildings that have long-term value and attempt to maximize value to the State of California by balancing the aesthetic, functional, and security requirements of courthouse design with the budget realities of initial construction cost and the long-term life-cycle costs of owning and operating institutional buildings. Applications of these codes provide uniform and predictable quality, functionality, and cost. In contrast to traditional Design-Bid-Build delivery, the transactional requirements of the Performance Based Infrastructure (PBI) turnkey approach drive the need for a fully integrated design process involving the architect, engineers, contractor and facility manager. When working with public agencies under more traditional delivery approaches, the objective is almost always to lower first cost. In the case of lowest bid selection, the long term operating and life cycle costs are often driven upward as a result of the selection of shorter lived equipment and less durable materials. Unfortunately, this rarely seems to get factored in by the public sector. With the risk of long term operations and life-cycle costs built in to the transaction structure, choices in mechanical systems and finish materials were driven not by initial cost but by total cost over the entire concession period. A good example of the types of choices made was the selection of terrazzo flooring versus carpeting in heavily trafficked corridors. Although a much higher first cost, this material is much more durable and enables the end user to avoid the higher cost of frequent carpet replacement. Another example is the construction of enclosed penthouses on the roof that provide additional protection for the mechanical systems against the marine environment of Long Beach. With guidance from the facility manager, the design team selected hard, durable but easily cleanable wall finishes to reduce potential for vandalism and for ease of daily servicing. As these examples illustrate, design and material choices can be heavily influenced by the life-cycle cost considerations inherent to a PBI turnkey approach. between each pair of courtrooms, seven holding cells allow separation of different classifications of in-custody detainees for the benefit of improved efficiency and safety of sheriff's deputies. View to Secured Courtyard looking west. Exterior view from Secured Courtyard to the Courthouse Atrium looking east. The courthouse was designed for sustainability, with numerous features, including good solar design, innovative, energy-saving systems for heating and cooling, automated light-harvesting systems, and water-conserving landscaping, as well as good access to mass transit. 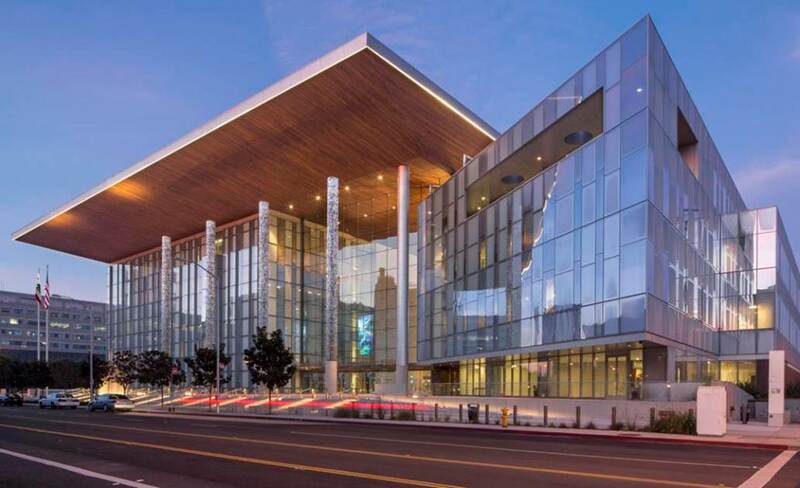 Originally designed to achieve LEED Silver certification from the U.S. Green Building Council, the project went on to achieve LEED Gold certification at no added cost, because of the shared sustainability goals of the Judicial Council, Long Beach Judicial Partners, and the court. The PBI contract allowed the courthouse to be constructed without any public debt funding and provides for the ongoing maintenance and performance of the facility. 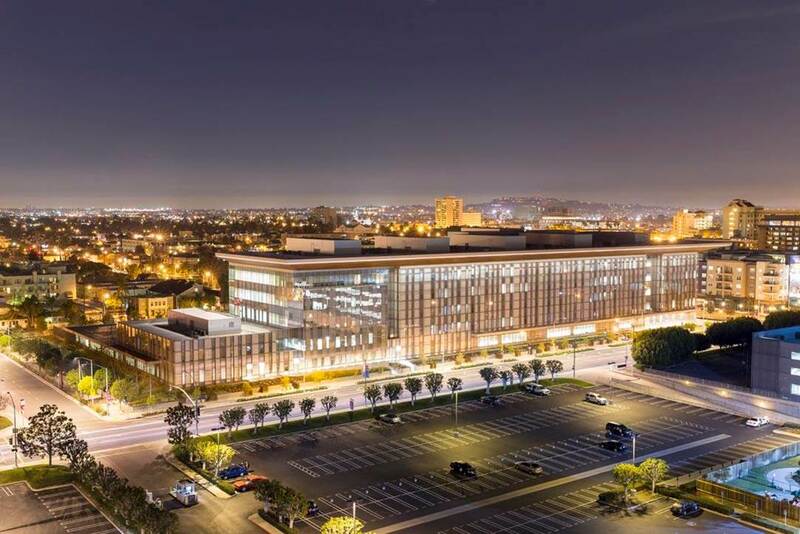 Under the PBI agreement, the Judicial Council of California (Judicial Council) will own the building and the Superior Court of Los Angeles County will occupy the space. The Judicial Council will pay an annual availability payment for 35 years. Under the terms of the agreement, the Judicial Council can deduct a specific amount from the availability payment if components of the building do not work. For example, there is a $5,000 deduct for every two hours that certain elevators are inoperable. Jury Assembly room seating and workstation area. Innovative use of finish materials in the courtroom design gave the appearance of a room centered on the judicial bench, a typical design standard, while in reality the bench is offset slightly from center for highly efficient use of the floor area. Also, durable cleanable surfaces such as hard wood veneer and back painted glass were used to reduce maintenance costs. The glazing was maximized on the northern façade for light management and finally, terrazzo which is more durable in high traffic areas with sound attenuation capability and lower total cost over 35 years than carpet was used. Typical Courtroom. View from spectator seating area. The design and construction documents went through a rigorous review of the Division of State Architect (DSA), a governmental State Agency whose jurisdiction was review and approval for Accessibility in accordance with building codes. Wide access, ramps, braille, and assisted listening devices were part of the approved design and incorporated throughout the building. The PBI arrangement made it possible to deliver a much-needed civic building with design excellence for the long term despite the lack of funds to pay for the project up front. Under the agreement, the state paid nothing until the building was occupied. The state has full ownership of the building and site and pays back on an annual basis the project's capital costs as well as annual operating and maintenance expenses over 35 years. Deductions can be made if the facility fails to meet certain performance criteria. Expansion room for six to eight additional courtrooms will be leased to Los Angeles County for the next 15 years, with the State benefiting from the revenue and the private sector carrying full responsibility unless or until the State chooses to occupy it. The building performs to stay in the productive range where performance and management standards are measured operationally and according to occupant's satisfaction. Operational considerations include regular audits of key performance indicators (kpis), testing and compliance with preventative maintenance programs, joint inspection of interior spaces and grounds, compliance with room air temperature and lighting standards, compliance with regulatory requirements, cleanliness, speed of response, and speed of completion of all end-user service requests. Occupant satisfaction surveys regularly measure, customer service approach, and provide a gauge for performance and follow-up for improvements. Entry plaza and water feature. Proactive planning minimized impacts to the community over the ongoing development. One of the challenges was the presence of water transmission lines, gas transmission lines, storm and sanitary drain systems, power, telephone cable, and fiber optic lines that crossed the site in several locations. Each of these utilities had to be relocated outside the building property before construction could commence. This work had the potential to affect the surrounding community due to the possibility of utility interruptions, long-term lane closures, and other neighborhood inconveniences. Recognizing this, the project team took an active role early in the process and coordinated the work to minimize impacts to the surrounding community. Within days of contract award, the team was working with the City's Department of Public Works (DPW), Long Beach Water Department, Long Beach Gas and Oil, and Southern California Edison to develop a plan of action to relocate the existing utilities so that construction could begin within a few months. This effort ensured that all approvals were in place prior to beginning work. The team met with those neighbors most affected and developed plans that included adjusting working hours to minimize noise and scheduling potentially disruptive activities outside of school hours for the Chavez Elementary School, which is located across the street from the site. 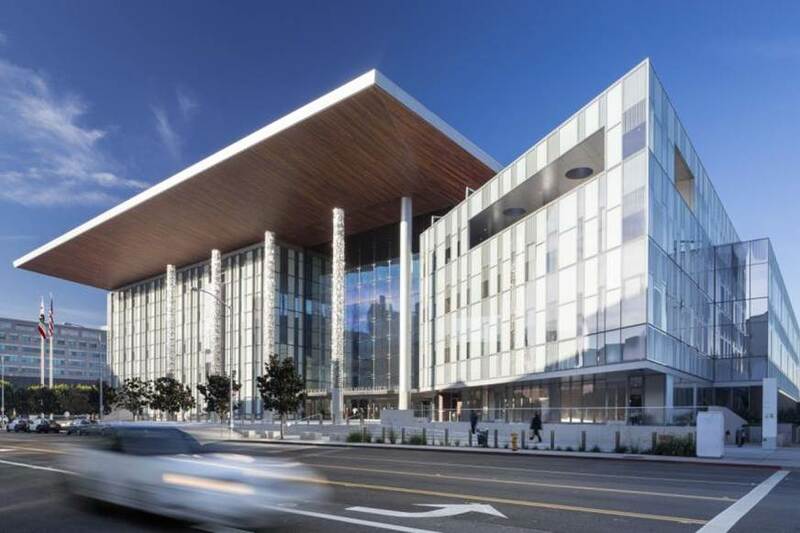 The Governor George Deukmejian Courthouse was designed and constructed faster in comparison to other similar cases and nearly two years faster than another similar project—the San Bernardino Justice Center—for two main reasons. First, the design-build (DB) delivery method used as part of the PBI process allowed for design and construction phases to overlap. In addition, construction activities were fast-tracked. The Judicial Council of California (Judicial Council) traditionally utilizes a construction manager at risk (CMR) delivery method as state administrative procedures do not allow overlap of design and construction. The CMR process requires sequential approvals of preliminary design, working drawings, bidding, and construction phases, taking more time to complete than fast-track DB. Second, PBI uses readily available private financing, which is not subject to the timing of state bond sales, which drive the construction start date for state-financed construction projects and can produce delays. The San Bernardino Justice Center construction start was delayed by nine months because of a cancelled bond sale. Main Entrance featuring one of two Art Program Commissions: Air Columns by Ned Khan, a California Public Arts Artist. The PBI method used to develop the Governor George Deukmejian Courthouse valued and supported collaboration throughout the design, construction, and operations transition processes, resulting in a project with predictable budget management and minimal change orders related to coordination of documents. This method relied on competitive procurement with multiple proposers. A court building with commercial leased space that could be utilized to meet future expansion needs using PBI delivery. The opportunity to transfer the risks of development and of delay to the private sector. PBI delivery allows the Project Company to select contractors for each of the phases of the project, providing for competition and potentially lower costs to the state at the design stage, during construction, and at the operations stage. A short list of eligible bidders was selected solely on qualifications. The final selection of the successful consortium was based on a combination of design, cost, financing, and facilities maintenance. Because the designer, builder, operator, and financial partners must collaborate on project development and implementation, the project itself is developed with a strong focus on long-term costs and operations. This collaboration is not possible under traditional project delivery, where each firm may interact only with the owner, not with each other and where operations and maintenance is separated from design and construction. An added benefit is that in PBI delivery a single firm is accountable for operation and maintenance throughout the 35-year contract term, providing the state with a single point of contact and responsibility, as opposed to the four firms that would be responsible for each of design, construction, operation, and maintenance in a traditional project. In PBI delivery the state owns both the project site and the building from the beginning of construction through the entire term of the service agreement. Another significant benefit to the state in PBI delivery is that in PBI the project company's equity investors and lenders are integrally involved in the development, design, construction, operation, and maintenance of the project where in traditional delivery, bondholders are generally indifferent to the degree of success of the project. However, the service agreement between the Project Company and the state allows the state's payments to be reduced if there are lapses in maintenance, or the building is not fully functional. In addition, the state is not obligated to make any service payments at all until the building is completed. The PBI approach maximizes partnership and collaboration in the design, construction, and operations process. A focus on predictable operations and maintenance over the building lifespan is an inherent quality of the PBI approach and is required because the project company not only must base its design on the needs of the public agency, but is also accountable to meet standards of maintenance, repair, and replacement over an extended period of time. This approach requires maximum collaboration and accountability and demonstrates cost-effectiveness by meeting long term operations and management obligations over the 35-year term of the project agreement. Holding cells are included to accommodate future expansion in the number of courtrooms. Clark's team worked to anticipate the needs of the end-users, as well as address any constructability issues, by constructing two full-size mock-ups of a courtroom and adjacent detention areas. Located in a rented warehouse building near the site, the first mock-up was constructed for judges, court reporters, Los Angeles County Sheriffs' deputies, and other court personnel to act out courtroom procedures and scenarios. During these sessions, these end-users provided critical feedback on the functionality of the mock-up. The judge's bench, witness box, courtroom clerk's station, court reporter's station, attorneys' tables, spectator seating, and jury box were mocked-up by the project team utilizing plywood or actual furniture. Also included were ramps to confirm proper accessibility and projection screens for evidence presentations. Various bench height options were provided for the presiding judge in order to achieve the ideal heights and sightlines. "The project team did a wonderful job in designing and constructing a mock-up that allowed the judges and staff to truly test the performance of the future courtrooms." The facility is the first social performance-based infrastructure (PBI) project in the United States. Under a turnkey public-private partnership, the cost and risk of the courthouse, including development, design, construction, operations, and maintenance, were transferred from the public sector to the private-sector through a Project Agreement with Long Beach Judicial Partners LLC (the Project Company). The performance-based contract allowed the courthouse to be constructed without any public funding and provides for the ongoing maintenance and performance of the facility. Under the terms of the agreement, the Judicial Council can deduct a specific amount from the availability payment if components of the building do not work. For example, there is a $5,000 deduct for every two hours that certain elevators are inoperable. Executing the project under the PBI model required a strong commitment to the schedule while balancing the demands of the price-certain contract with stakeholder input. By integrating the expertise of the private-sector team members in the development and design-build process, the group met the goals of the client, and the project, and delivered the courthouse 11 days ahead of schedule. The project agreement for the Governor George Deukmejian Courthouse requires the project company to operate and maintain the new courthouse for 35 years and then return it to State ownership in a specified condition and requires that the project payments to the project company be reduced if these terms are not met. The project company, not the Judicial Council, has assumed the risk of operating and maintaining this facility to a high level for the 35-year duration of the project agreement. Commissioning: The project company determined that the commissioning requirements of the project agreement were not adequately rigorous to meet the occupancy requirements and, hence, increased the scope at its own cost to mitigate the risk of not meeting the occupancy requirements. Construction-to-Occupancy Transition: The design-builder and operator established at their own cost a "coordination agreement" that holds the construction contractor liable for post-warranty work for two years to mitigate the risk of payment deductions as a result of availability or performance problems due to construction defects. Life Cycle and Maintenance: The project company is responsible to address any building degradation, through a maintenance and life-cycle replacement regime, to meet the quality standards laid out in the project agreement. Ernst & Young led the risk management process in a manner consistent with standard industry practice. Once each risk had been reviewed, a risk matrix was populated and a range of values for each risk was determined by using the stochastic modeling software @Risk. @Risk is commercial software that undertakes Monte Carlo simulation and is extensively used by major organizations to analyze risk and uncertainty in projects. Through @Risk, the mean value of each risk is determined, and then the risk values are grouped into risk buckets corresponding to the period in which each risk is likely to arise in the procurement. The MEP systems were designed using Building Information Modeling (BIM) which helped with system (ducts, sprinkler pipes, lights, structure) conflict detections. Sub-consultants in the trades were active during the design, but this created a bit of a problem between their varying software systems interacting with BIM. Clark solved this by incorporating their information into the BIM model they were using. The involvement of JCI, the building operator, during the design of the project helped to ensure compliance with Performance Standards that were real and achievable. Constructware is a proprietary software used to monitor design and construction activity, document files, and provide project historical documents. Exceeding efficiency requirements established by building codes. The building use of good solar design. The long side of the building takes best advantage of the southern exposure for light and winter heat in offices. The curtainwall was designed to minimize heat gain in summer. The courtyard and public waiting areas are in the cooler and shaded northern exposure. Innovative displacement ventilation air distribution in the courtrooms not only provides energy efficiency, but also improves indoor air quality, thermal comfort, and noise reduction. The automated light harvesting system optimizes use of natural light to save energy without compromising occupant comfort levels. LED lighting fixtures reduce energy use and reduce operating costs. Energy Star equipment, including low-flow water fixtures. Carbon footprint reduction results from provision of bike lanes and bike racks and the close proximity of the courthouse to public transportations and the Los Angeles light rail system. The building received LEED NC Gold Certification, exceeding the required Silver established in the Project Agreement. Implementation of regular Preventative Maintenance on systems and equipment. Robust Building Management System (BMS) to monitor performance and trends and therefore allow for adjustments. Promoting building occupant participation in energy conservation initiatives. An Annual Energy Target is set by using the first 2 years of consumption compared to the Energy Model. Data is collected for each month and then the data for each of the 24 months is plotted. The first three months are not counted. Simple linear regression analysis, based on the single variable ("degree days") is used to identify the base load and slope of a straight line equation to predict consumption based on degree days. The Annual Energy Target formula is set for the subsequent 5 year period (i.e. contract years 3-7). Based on the 20 year average for the year that just completed, the formula is used to set the consumption target for the next year. The annual target is then at the end of the year adjusted for actual heating degree day figures and an adjusted annual energy target is calculated. The Annual Energy Target formula is re-set at the end of year. If costs incurred are higher than 3%, The Project Company contributes 50%. If costs incurred are lower than 3%, The Project Company and JCC share in savings at 50%. If costs incurred are within (+/-) 3%, no sharing is triggered. Reliability has been as expected, good. There have been no interruptions in service with the exception of a planned power outage requested by SoCal Edison for an offsite service repair. Governor George Deukmejian Courthouse: Evaluation of Cost-Effectiveness, Report to the California Legislature as Required by Senate Bill 75, Stats. 2013, Ch. 31, June 2014. "Outcome Based Codes: Answering The Preliminary Questions." Strategic Planning for Energy and the Environment 31(4): 35-55. by Colker, R. M. 2012. Project Delivery Methods of the Future by Cooley, L. and P. Cholakis. World Workplace 2012, IFMA, 2012. "Public-Private Partnerships: A New Tool For California's Infrastructure Needs." by Eliopoulos, W. T., K. Badiei and A. G. Marrazzo. 2013. "Public-Private Partnerships in California." by Douglass, B. S., J. A. Sykes, J. L. C. Page, K. E. Hicks, R. G. Z. Page, S. O. Page, K. J. P. Page and K. S. D. Page. 2013.